One of the most annoying things about Google’s contact manager is that it doesn’t have a “trash” section. If you accidentally delete some of your contacts, it’s impossible to retrieve them without a backup. This is a big problem if you use a buggy software that tries to sync your contacts, but manages to overwrite them. Google tried to address this issue by adding a new option that lets you restore your contacts. You’ll find it if you visit Google’s contact manager and click on the “More actions” button. “You can restore your contact list to the state it was in at any point within the past 30 days. 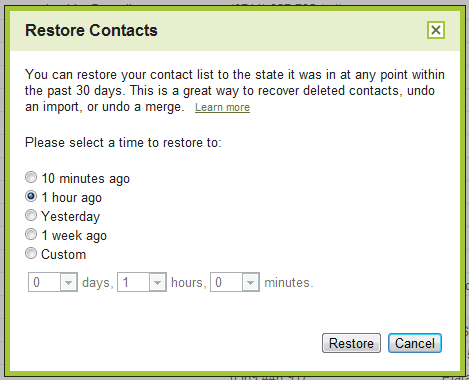 This is a great way to recover deleted contacts, undo an import, or undo a merge,” explains Google. While this is a very useful feature, Google’s implementation doesn’t help users who don’t remember when they made a mistake. Google should have listed the most recent changes and allowed users to pick one of the revisions, like in Google Docs.